Editors Note: The following is a guest post from Ruth Harrison-Roberts. If you’re someone who prefers to live life in an eco-friendly way, you may be wondering how exactly you’ll manage it in Singapore. The city-state is, after all, a very built-up place, with a dense population, busy roads and high-rise buildings dominating the skyline. However, it was in fact designed as a garden city! You would never consider grouping it in with Letchworth and Welwyn in the UK, but the premise remains the same: soften the urban sprawl by planting trees along the highways and byways and creating parklands. 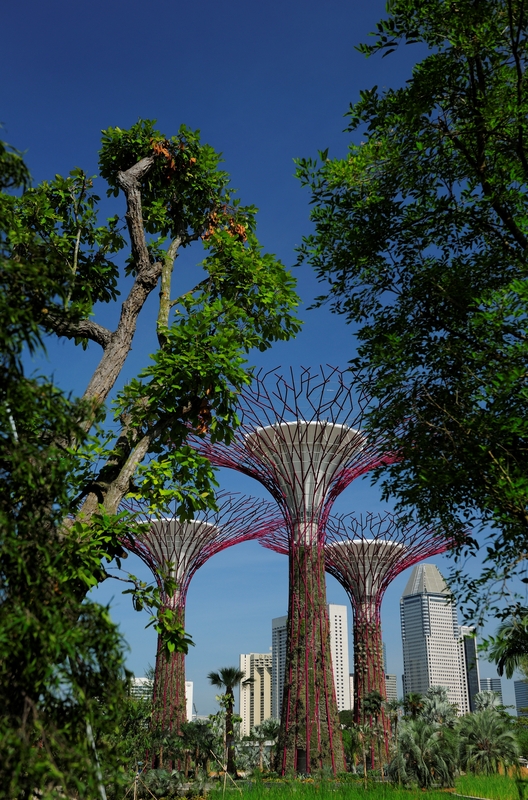 And, this is one of the first things that people tend to notice when they visit Singapore – just how green it looks. If you’ve never had the chance to experience the Aurora Borealis, if you’re willing to include a trip to the frozen wilderness, the Hotel Kalslauttanen will be a light in the dark (literally). The Hotel & Igloo Village Kakslauttanen in Finland’s famed Lapland has 21 first-class igloo-like cabins. Its igloos could be mistaken for snow but are instead transparent glass fashioned to look like clear transparent ice but designed to keep heat in for a cozy stay. The hotel's Ice Lounge - a James Bond moment anyone? With such amazing natural splendor all around, sure makes me wish I could be there to enjoy New Year’s! During my recent trip to Costa Rica, I visited three eco-resorts. All were based around the idea of sustainability, but how this played out was gloriously diverse. You wouldn’t call Lapa Rios – the 2nd eco-resort on my “tour” -a luxury resort. Yet its charm and beauty make it a first class green destination. For those used to being “plugged in”, it’s a system shock, but one guests surrender to. Located on the southern tip of Costa Rica, known as the Osa Peninsula, the motto of Lapa Rios, says Pinto, is “Experience, Learn, Connect, Relax”. ““It’s important in the tropical forest to learn, to take something (back) with you,” he said. Surrounded by rainforest – both primary (old growth forests) and secondary (former pastures that have been reforested) – and bordered by a private nature reserve with amazing wildlife and pristine beaches, conservation and sustainability are evident at this beautiful resort. All the furniture is made from wood from sustainable plantations. Baskets and dispensers are made by local craftsmen. Footbridges that connect trails on the property are made from discarded railroad ties. All the electricity is generated via solar. Lapa Rios keeps pigs on the property (away from guests, of course). What leftover food they don’t eat goes to the property’s biodigester to produce biogas for cooking. The food at Lapa Rios was both beautifully prepared, delicious and organic. Buying locally, though preferable, can be challenging, Pinto says. Locals may have some but not all of what the resort needs. They make up the balance from San Jose – a ten hour drive. But Lapa Rios encourages local vendors and suppliers. Quality and commitment are equally important with their suppliers, Pinto explained. Embracing the community is a sustainability trait I also found at Arenas del Mar. Though there’s a great deal more to come – about eco-resorts, the rainforest and sustainable business practices I observed – this expanded view of sustainability is one the U.S. would do well to consider investing in. After theSan Jose conference, I spent 2 1/2 days at Arrenas del Mar, an eco-resort surrounded by rainforest. I began discovering what the term ec0-tourism meant. Built to be a combined luxury-sustainable resort. Arenas del Mar’s exquisite beaches co-exist with Manuel Antonio National Park, filled with some of the most amazing wildlife on the planet. Another eco-related element is how they keep their swimming pools clean. Rather than use chemicals, Arenas del Mar uses an ionization process , running an electrical charge through colloidal silver and colloidal copper. At the government’s insistence, they do use a small amount of chlorine. “Sometimes you’ll see the iguanas drinking the water – they know it’s safe,” said staff member Kalinga Rodriguiz, who led my sustainability tour around the property. Arenas del Mar was the first eco-construction to be proposed in Costa Rica twelve years ago. The idea was so new, the government didn’t understand what this was. This began a new chapter for Costa Rica, one that would lead this Latin American country to become known as a premier eco-tourism destination. The government, or rather the MINAE (the Ministry of Environment) sets strict rules eco-resorts must follow. During construction, the resort was only allowed to fell a total of 26 trees on their approximately eleven hectares of rainforest! Despite this restriction, they succeeded, cutting only 19 trees while using downed wood. And best of all, the resort’s so well integrated into the rainforest, it creates a minimal impact on the surrounding environment. There’s a great deal to this sustainable resort. Be sure to come back for more!